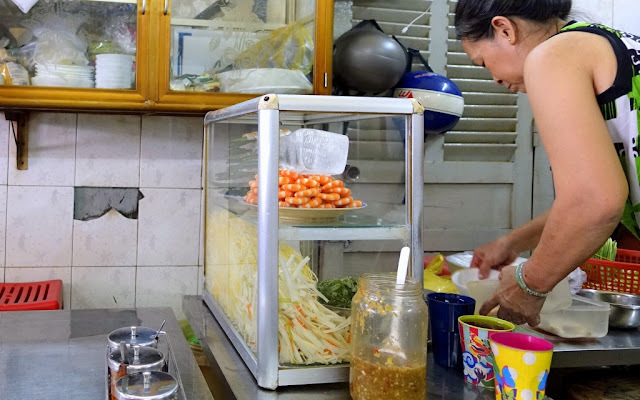 Contrary to popular opinion shared by friends and family members, I did not eat pho every day for every meal during the long weekend I was in Ho Chi Minh city. 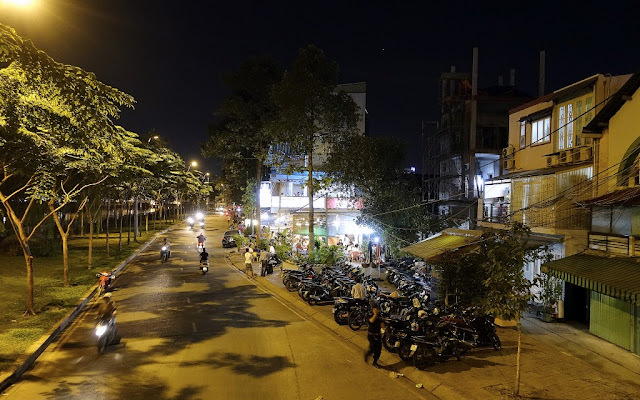 Not that I didn't want to but there was just staggeringly excellent food to be found in many parts of the capital to limit myself to just that one aspect of Vietnamese cuisine. 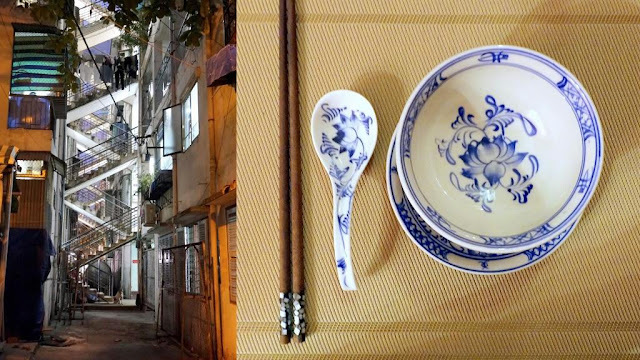 I had already written about the warm welcome I'd received at a local Vietnamese home (courtesy of Eating Saigon) and that was a really special experience I'd recommend anyone. But aside from that detour, I pretty much stuck to local favourites in and around the city. 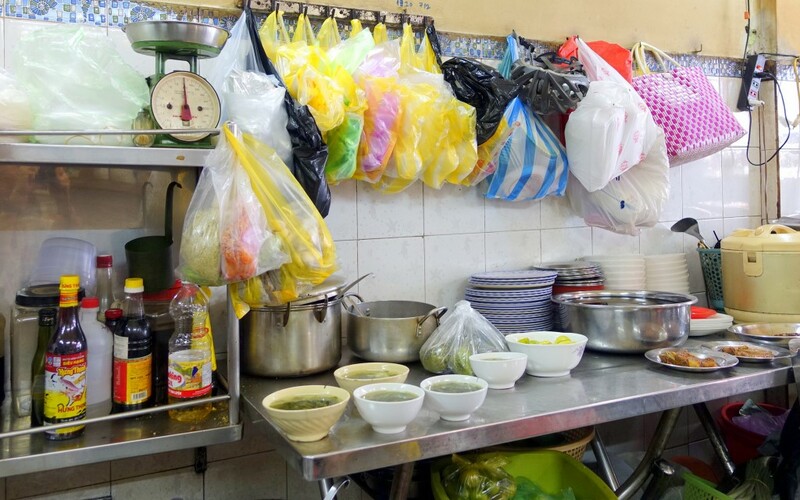 These ranged from hole-in-the-wall noodle restaurants where you slurp your soupy rice vermicelli whilst literally squatting on eight-inch stools, to coffee cafes with a chilled nostalgic vibe, to culinary school kitchens, to a rural eating post just off the Mekong river. If I live in Ho Chi Minh city, I'd probably make it a point to eat here at least once every week. Yeah, it's that good. 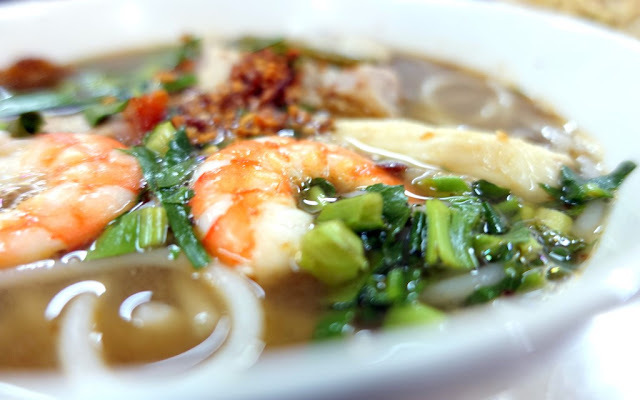 Its specialty is bún mắm (which roughly translates to fermented fish noodles), and foodies who are familiar with assam laksa will know what I mean when it eats more like a stew than a straightforward noodles-in-soup creation. The broth is rich and on the sour, sweet, salty, tangy side; aside from the rice noodles (the round type, not the flat one,) it's filled with roast pork, fresh shrimp, squid, catfish, eggplant and chives. As an added bonus, there are the ubiquitous condiments, namely beansprouts, cilantro, basil, mint, jalapenos, as well as lime slices and fresh ground chili paste to create this symphonic explosion of taste with each bite. 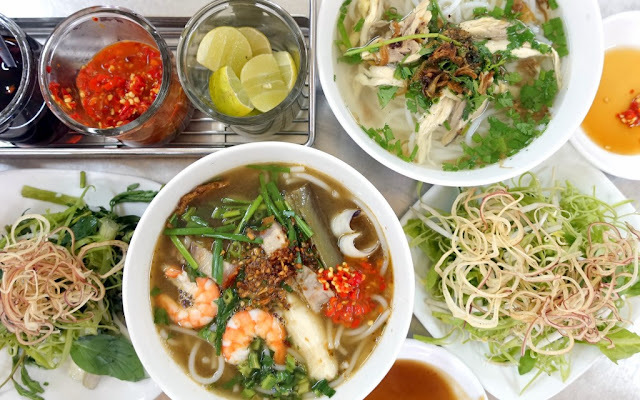 Essentially a more potent version of pho, this soupy creation works more like a stew with fermented fish paste to give it that extra kick. 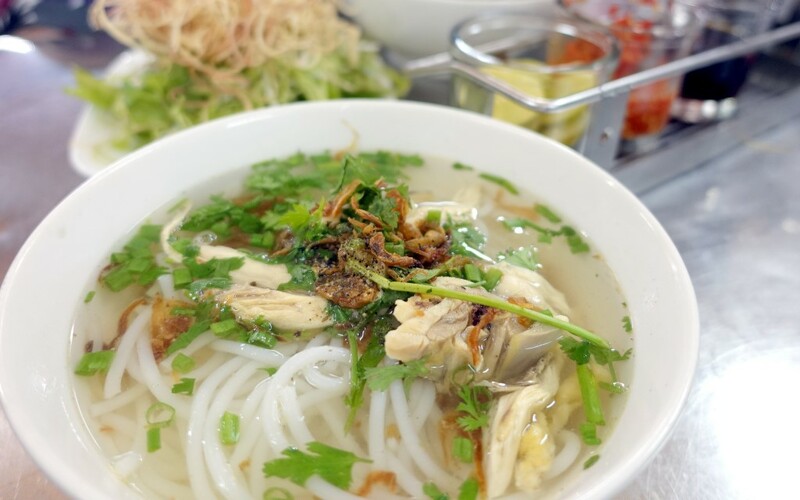 Those who are freaked out by all that umami-ness of the bún mắm may opt for the clear soup version with chicken slices, lots of spring onions, coriander and fried shallots for taste. Comes with the same batch of raw condiments on the side. 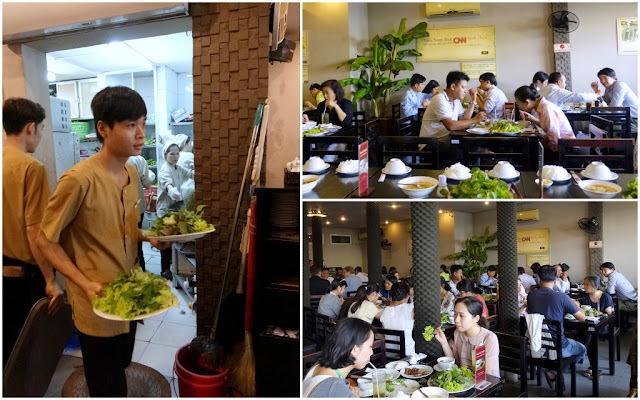 The restaurant is essentially bare bones with diners seated on little red stools that are so close to the ground they're pretty much squatting as they slurp their noodles. 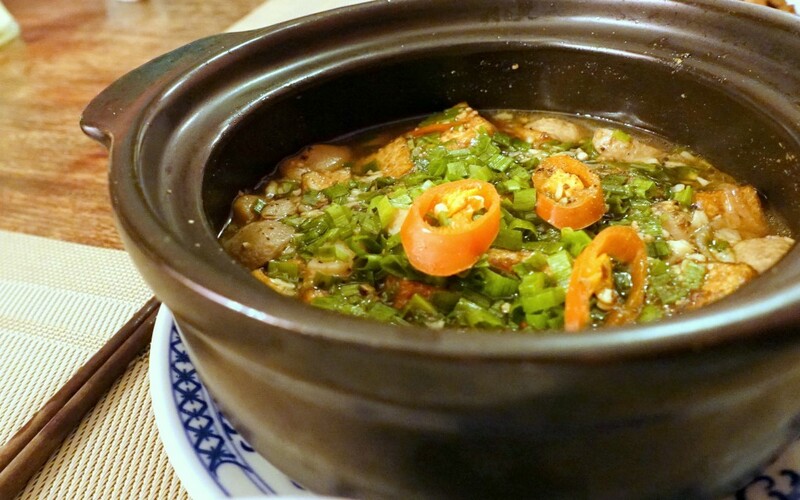 Due to the limited menu (these restaurants are the best as they basically specialize in doing one dish super well,) it doesn't matter if you can't speak Vietnamese as you can just point to the cauldrons of steaming hot broth (it's an open kitchen concept) and indicate with your fingers how many bowls you want. Note: Those who are squeamish about eating in such an environment - no air-conditioning to speak of, pails of dirty dishes and leftovers stacked a few feet away, the open prep and cooking areas, communal sharing of tables, and yes, assuming the semi-awkward squatting/eating position - may not be comfortable here. 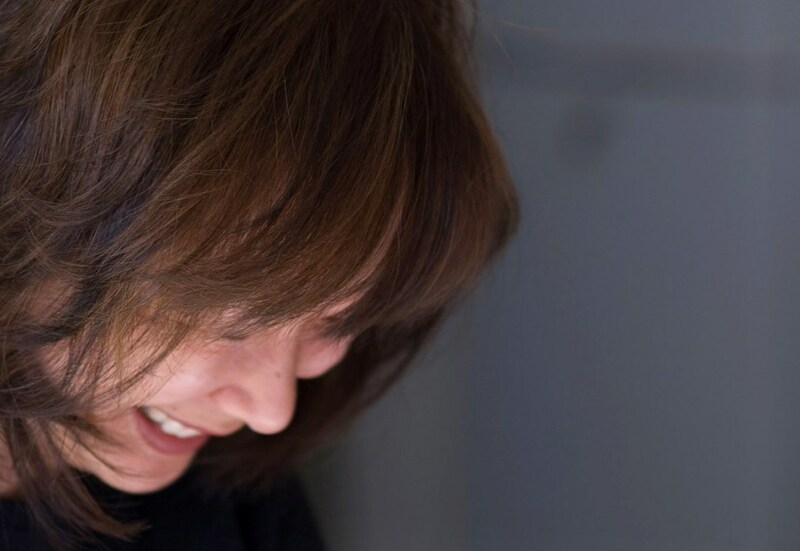 I loved it for all those reasons above. And my god, those noodles! Amazing. The restaurant is not hard to find as it's located just across the street from the famous Ben Thanh market at one section of the giant roundabout. 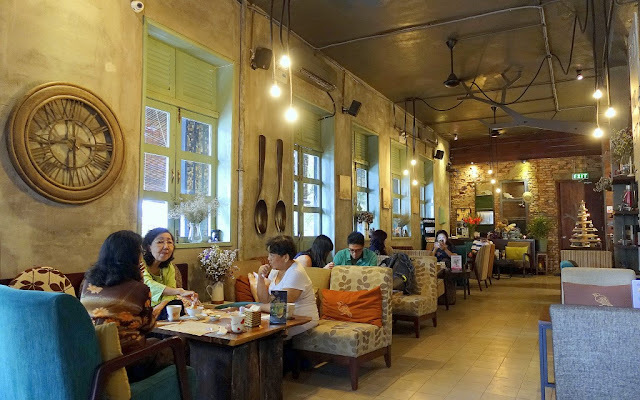 Located in a colonial shophouse, this cafe was a wee bit challenging to find as there's a downstairs section where NOBODY goes. We seated ourselves and waited like goondus until we figured something was amiss; we then asked a server (at least that's who I think he was) where, um, everyone was. 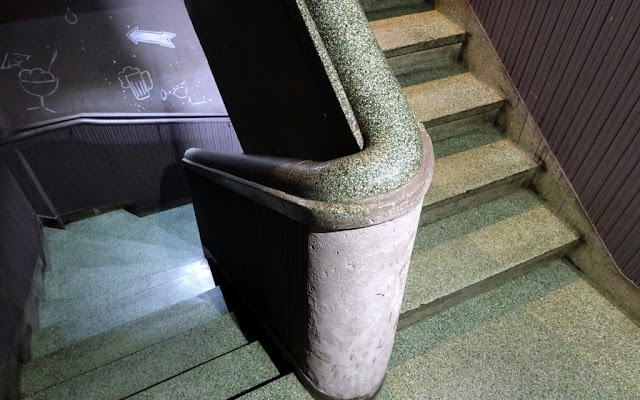 He pointed to the side where a block of granite stairs led up to the actual cafe where it was positively buzzing with activity, people, music, and that familiar sqoosh of a cappuccino machine in operation. So THIS was where everyone was - duh. 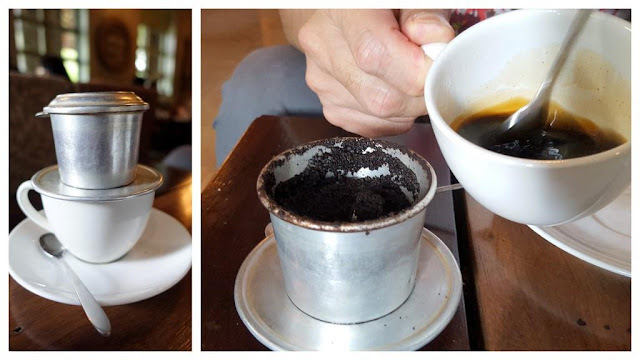 As this was our first day in Ho Chi Minh city, that exceedingly strong drip-coffee with a touch of condensed milk was one of the must-have highlights. 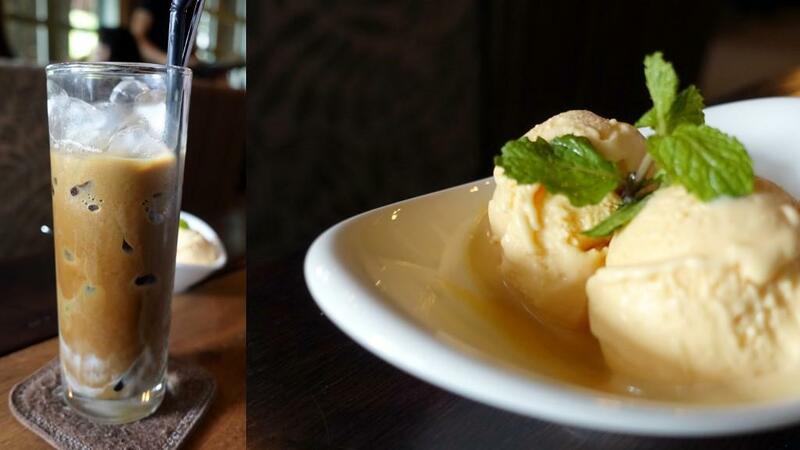 Amongst other curiosities, id Cafe is known for ice cream flavours that combine ingredients that you never thought were possible together (avocado and pepper? Strawberry and balsamic? Coffee and cinnamon???) and so in the spirit of derring-do, I ordered the Chilipassi - passion fruit and chili - which turned out to be more tart than spicy. Kinda like a creamy sherbet. And most yums. That was quickly followed with a baked raspberry cheesecake. This family-run restaurant has an unassuming facade and is flanked by clothing boutiques, bicycle repair shops and nail salons. So it might be easy to walk by and not know that they are famous for serving up only two items on their menu. Which is, judging from the packed interior and the line of people waiting for a table, apparently all they need to be successful. 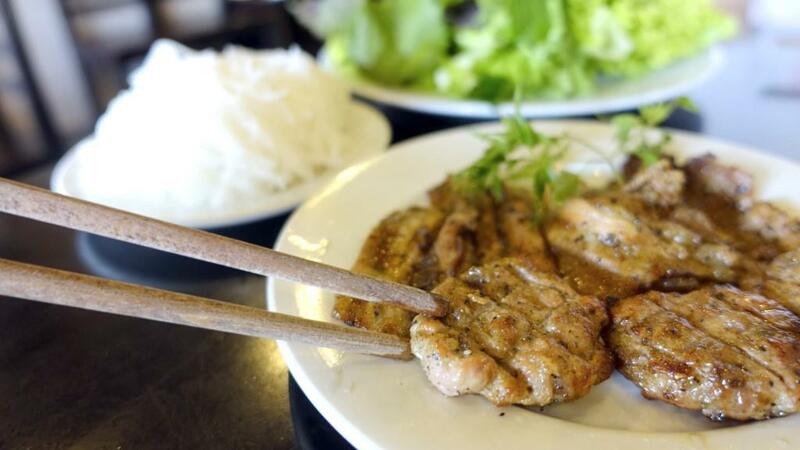 The first item is the seasoned, grilled pork patties which you eat, enchilada-style with lettuce leaves and vermicelli for that right neutralizing blend of firmness, tastiness, saltiness and cool crunchiness. 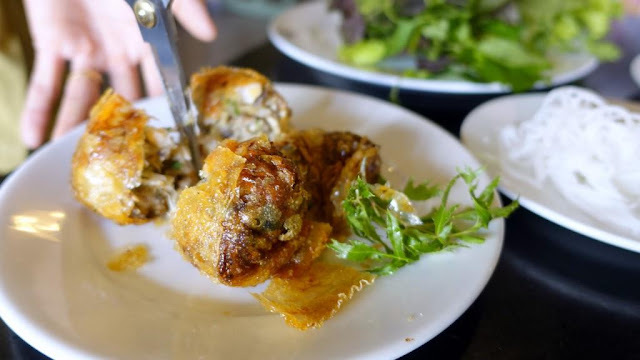 The second menu items is definitely the star of the two: I'm talking about deep-fried crab spring roll - so thick and dense that the server has to walk around with a pair of scissors to cut them into more manageable portions. 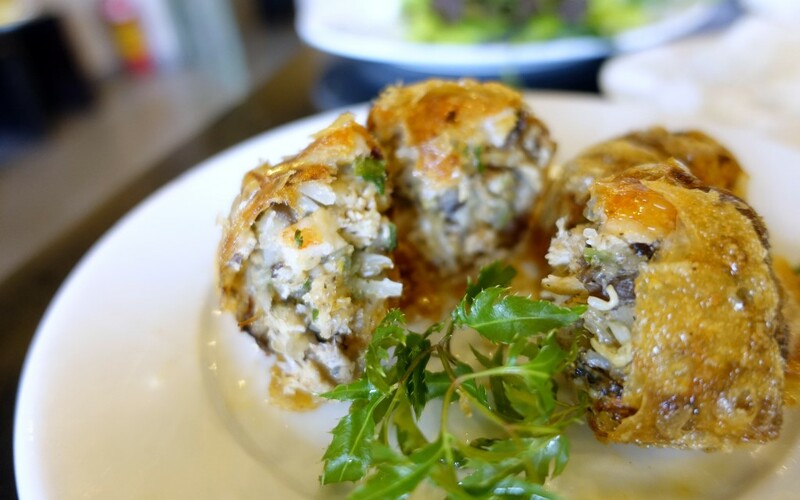 It's served with a light tamarind fish sauce to offset the slightly sweet texture of the crab. The skin of the spring roll positively crackles and crumbles which is a good sign that it's not been sitting in its own grease. Not at all ideal for your arteries, but oh so, so good for the soul. The piping hot crab spring rolls two seconds before I devoured them. The perennially packed Quán Nem Vuông restaurant with servers flying in and out of the kitchen. It has two floors and blessed air-conditioning. For something a little bit different, we heard about this non-profit culinary school / restaurant that serves up authentic Vietnamese dishes with a side of refinement. So we set out to this little alley just off the river, right at the edge of District 1. 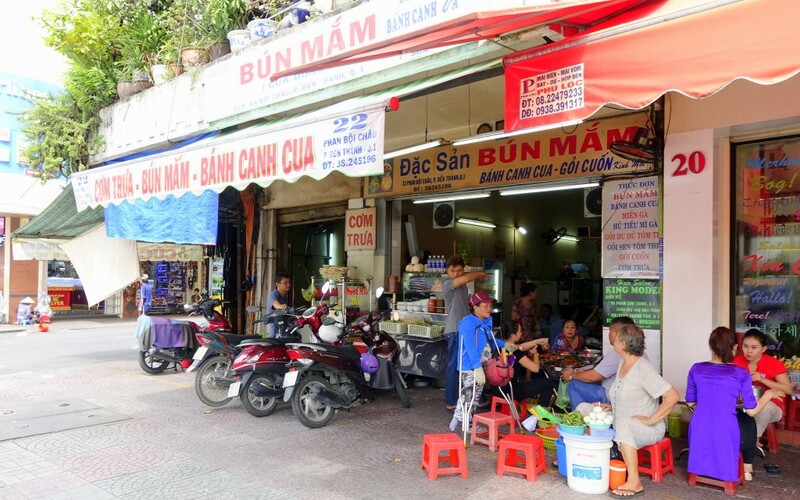 Tucked in one of the lanes that are filled with mom-and-pop provision shops, local coffee shops and fruit sellers is a slightly dilapidated French Colonial building that houses Bloom Saigon Restaurant. The main street with the river on the left of the photo. Bloom Saigon is in a small lane on the right. 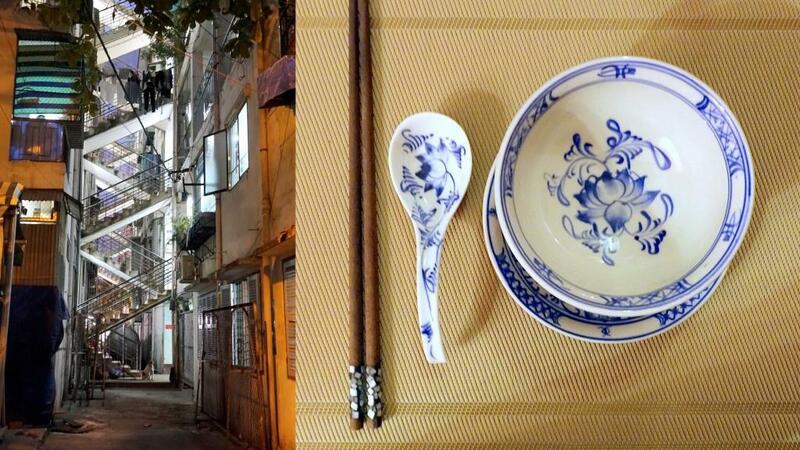 Finding the restaurant in this quiet dim alley was a bit of a challenge. 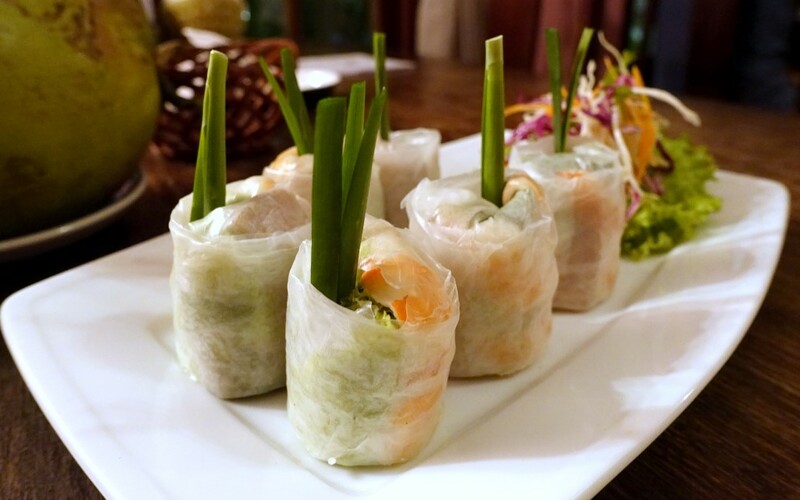 Fresh prawns wrapped in rice vermicelli rolls. 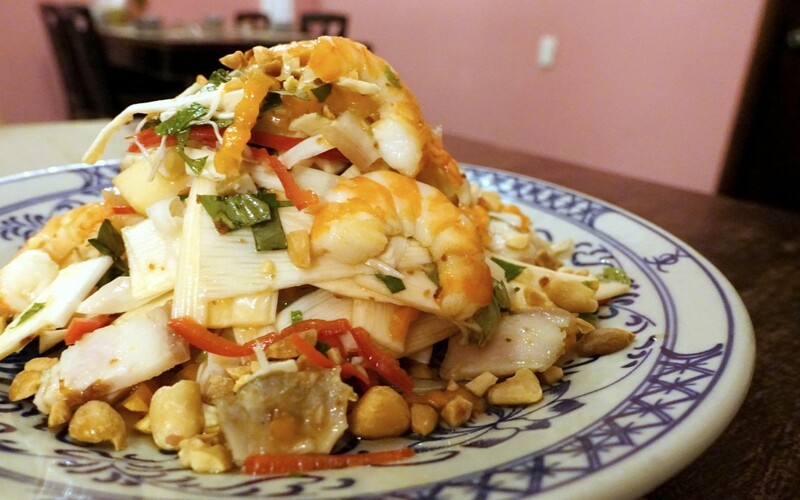 Heart of palm salad with prawns and pork belly. The restaurant proclaims that they don't use any additives, i.e. MSG in their dishes. As if that isn't a good enough reason to visit, just know that Bloom (which awesomely stands for "Because Love Overcomes One's Misfortune) Saigon is run as a non-profit, with proceeds from the diners going to ACWP's causes. 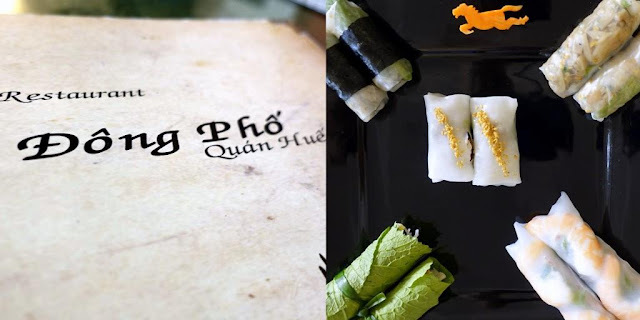 The young chefs prepare the flavourful Vietnamese comfort food favourites under the guidance of Asian Fusion Executive Chef Jacqueline Kieu and French Executive Chef Hung Tu. Reservations are highly recommended. 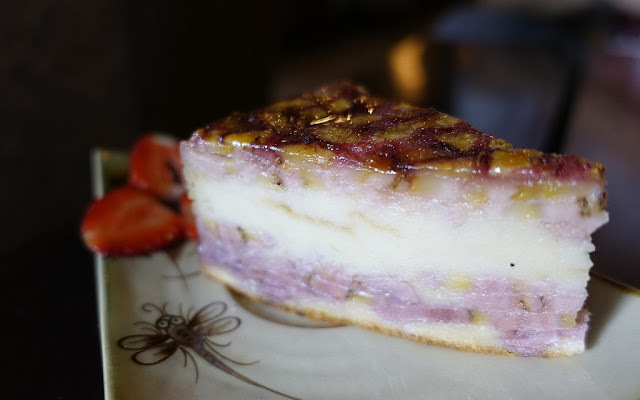 I met up with old friends who recommended we dine at this lovely restaurant featuring Hue-influenced cuisine and which also doubles as a patisserie that sells beautiful macarons and assorted French pastries. 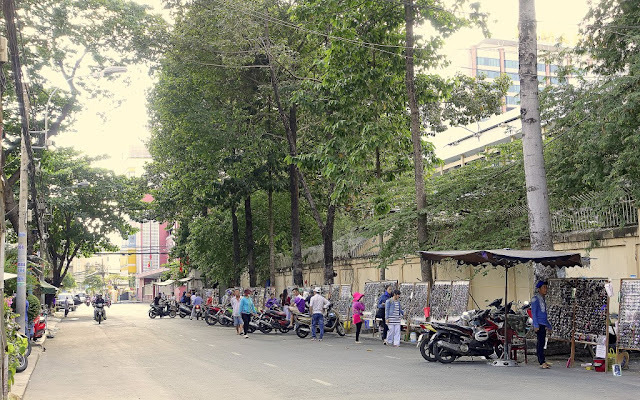 Just slightly off the main CBD of HCM city, Dông Phố is set on a relatively bustling (but not crazy frantic) street flanked by street vendors, embassies, schools and banks. Sunglasses vendors lining the street. Starting things off right with an appetizer platter of local favourites. 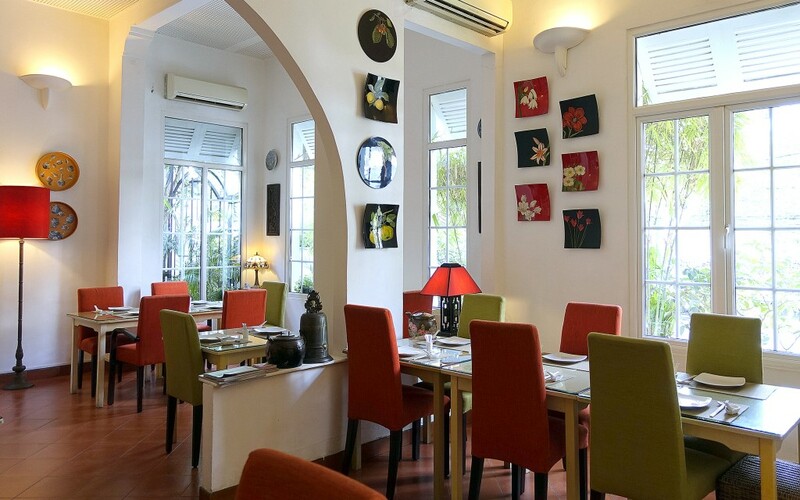 The bright airy interior of the restaurant which used to be a colonial residence. 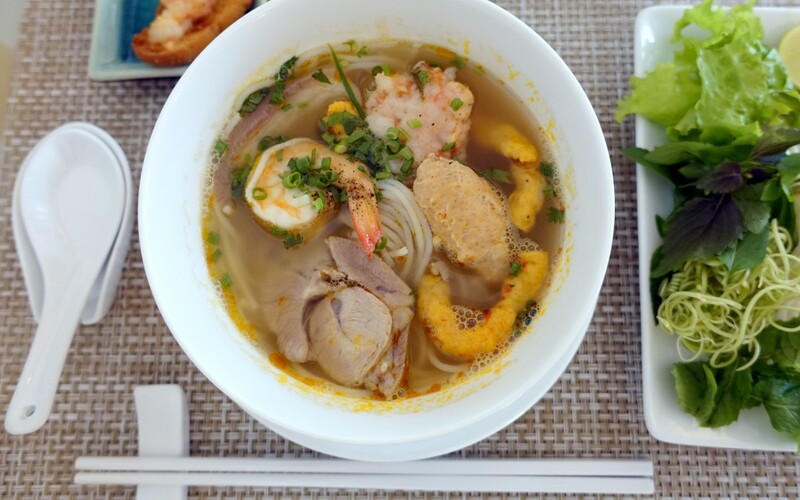 My soupy noodles lunch order of Bún suông: rice vermicelli with sliced pork and shrimp. 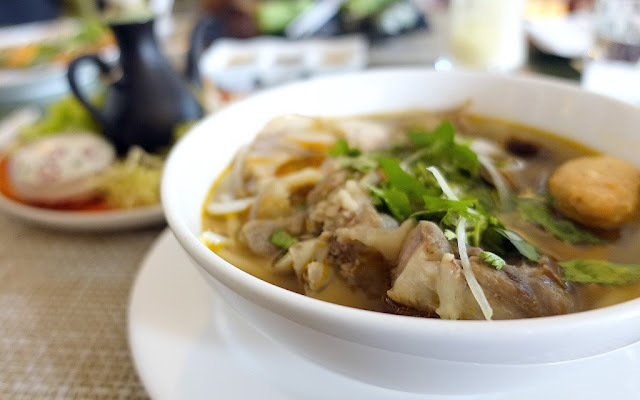 Bún bò Huế - a hearty bowl of rice vermicelli in a Huế-style, lemongrass flavored beef broth, served with thin slices of beef and pork knuckles. 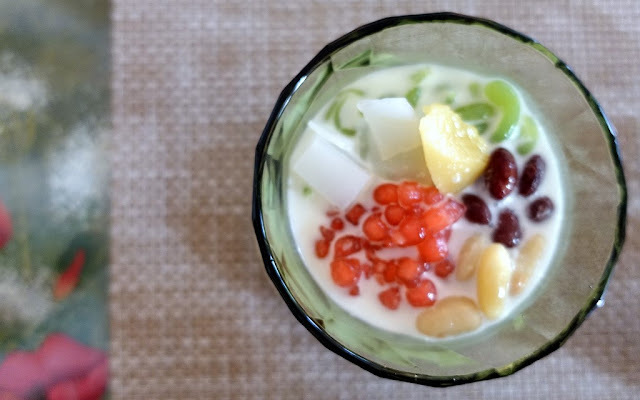 Chè thập cẩm - my dessert of cold coconut cream with red beans, agar agar, red rubies and boiled yam. So this is a strange monolith of a modern structure set amidst ramshackle two-storey high provision shops and local mom-and-pop enterprises. To say it looks out of place in the neighbourhood in which it's set is an understatement, even more so when one steps inside and sees this cavernous architectural marvel within. Gem Centre is actually a private convention space - smallish as event spaces go, but massive in the context of its location. I only ventured inside as it was close to my hotel and I was curious to know what lay within. 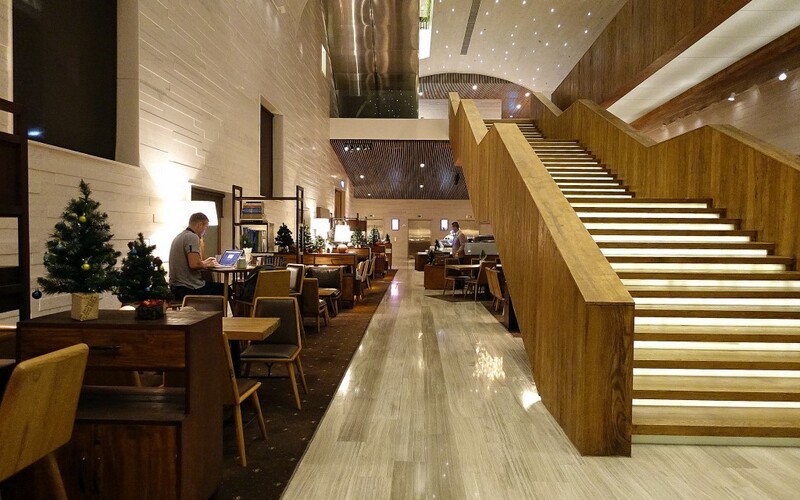 There's a restaurant called The Log in the upper floors but I liked much better the decor and elegantly retro feel of the Cafe on the ground floor. 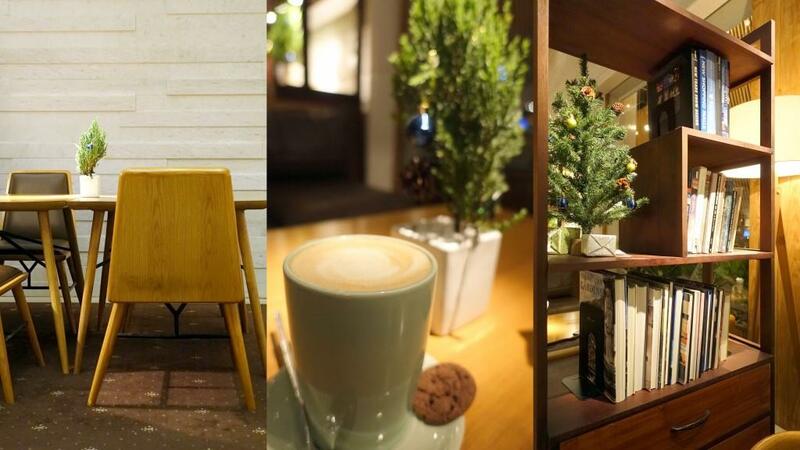 On the ground floor is a beautifully laid-out cafe that serves light meals (think afternoon tea, cafe bites) with a bar serving happy hour type beverages throughout the day and evening. 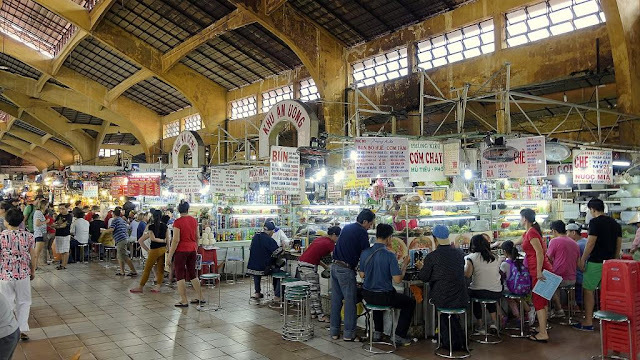 It's a great space for hanging out, chilling in the air conditioned splendour, and perusing their coffee menu, before venturing back out into the manic city streets (see below photo) of Ho Chi Minh city. 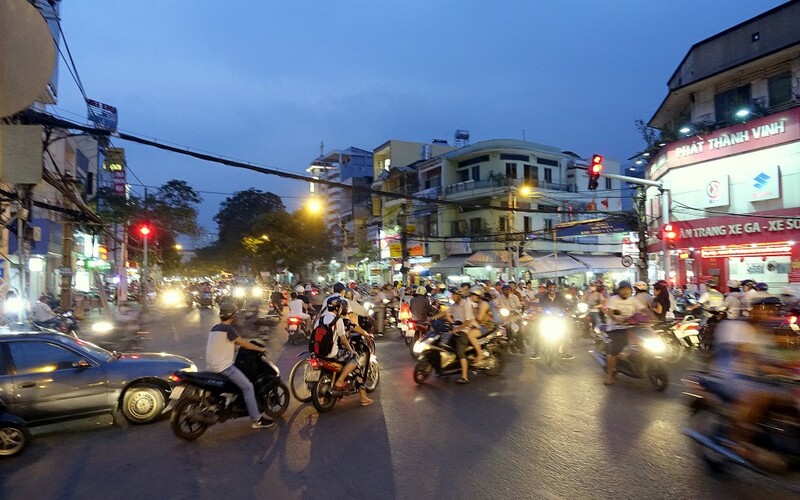 The intersection of Nguyen Thi Minh Khai and Nguen Binh Khiem in Ho Chi Minh City. © GoodLifeGoodTimes | All rights reserved.